Do you have a business idea and you want to work with another company to promote and sell it? You may want to consider a joint venture. This article focuses on the tax and legal issues involved with joint ventures. A Joint Venture (JV) is a cooperative enterprise entered into by two or more business entities for the purpose of a specific project or other business activity. The reason for a joint venture is usually some specific project. Joint ventures can be informal (a handshake) or formal, and they can be short term or long term. 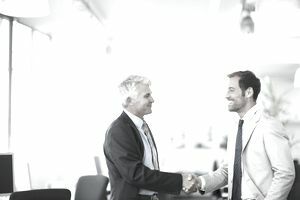 Often the joint venture creates a separate business entity, to which the owners contribute assets, have equity, and agree on how this entity may be managed. The new entity may be a corporation, limited liability company, or partnership. In other cases, the individual entities retain their individuality and they operate under a joint venture agreement. In any case, the parties in the JV share in the management, profits, and losses, according to a joint venture agreement (contract). Joint ventures are often entered into for a single purpose - a production or research activity. But they may also be formed for a continuing purpose. Both companies have some proprietary (ownership) basis for in this shared interest. For example, two companies with online patents for accounting apps might form a joint venture. They agree to share income and expenses. Both companies in a joint venture maintain their separate identities for all purposes except those of the joint venture. Why Form a Joint Venture? To combine resources. A bigger entity may have more clout in an industry or more resources to ensure the success of a venture. To combine expertise. In technical businesses, one company might have expertise in one part of a venture while the second company might have expertise in another part. For example, Company A might be good at creating software, while Company B has experience creating the hardware that's needed for a venture. To save money. Two companies might consider a joint venture to save money on advertising, maybe at a trade show or in a trade publication. MillerCoors is a joint venture between SABMiller and Molson Coors Brewing Company to see all their beer brands in the U.S. and Puerto Rico. In 2011, Ford and Toyota agreed to work together to develop hybrid trucks. Mining and drilling are expensive propositions, and often two companies in these industries will combine as a joint venture to mine or drill in a particular area. You can form a joint venture informally with just a handshake, but it's always best to have something in writing. A joint venture, even if it's between two small businesses, should have at a minimum this sort of written agreement. All that's needed to form a joint venture is a written agreement (a contract) between the parties. The agreement should spell out the details of the purpose, how the two (or more) parties share in profits and losses, and how the parties share in making decisions about the joint venture. When a joint venture is formed, the most common structure is to set up a separate business entity. Then the parties each own a specific percentage of the entity. If the joint venture is a corporation, for example, and two businesses have equal shares in the business, they structure the company so each partner entity has an equal number of shares of company stock and equal management and board of directors members. The joint venture isn't recognized as a taxing entity by the IRS. So the business form that the joint venture company takes determines how taxes are paid. If the joint venture is a separate business entity, it pays income taxes and all other taxes like that business form. For example, if the new joint venture company is an LLC, it pays taxes as an LLC. Because the two parties have decided on how to split profits and losses, they will use that split to decide how each party receives profits, handles losses, and contributes to paying any taxes that are due. If the joint venture is simply a contractual relationship with an agreement between two independent companies, the terms of the agreement will determine how the joint venture is taxed and how the tax is apportioned between the two entities. A joint venture may have some similarity to a partnership, but it's not. A partnership is a single business entity formed by two or more people. A joint venture joins several different business entities (each of which may be any type of legal entity) into a new entity, which may or may not be a partnership. Partnership income taxes are paid by the owners individually. You may have heard the term "consortium" used to explain a joint venture. A consortium is a looser arrangement between several different and distinct business entities. A consortium doesn't create a new entity. In the travel industry, for example, a consortium of travel agencies allow memberships with benefits. The consortium negotiates on behalf of its members for special rates from hotels, resorts, and cruise lines. Any two businesses of any size can work together on a joint project, while still maintaining the rest of their business apart from each other. Some related articles that might give you additional ideas for possible joint ventures. Scott Allen, Entrepreneurship Expert, has written more about the advantages of joint ventures and how they work. How Does an LLC Owner Get Paid? LLC or Corporation - What's the Right Choice? What Does Limited Liability Mean to a Business Owner? Which Should I Form—an LLC or a Partnership? How Do I Change My Corporate Articles of Incorporation? How Do LLC Guaranteed Payments Work?